This one of a kind journal lets artists and authors plot their picture books. 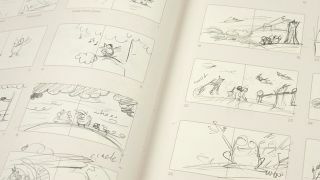 When it comes to illustrations and storytelling, a lot of careful planning has to take place to ensure that both the author and the artist have a clear idea of what to expect. Laying the groundwork is an important part of the process for story book illustrators and web comic artists, but there hasn't been a notebook that caters to their needs. Until now. Created by children's book publisher Tadaa books, the Storyboard Notebook – For Picture Books takes a traditional journal and adds a storyboard template to the pages. The result looks like a blank comic waiting to be filled in by imaginative illustrators. "As picture book creators, we storyboard a lot!" explains Ozan Tortop from Tadaa Books. "We tried printing templates on basic A4 and A3 papers. But putting them together, archiving, and carrying them with us all the time was not easy. Oh, and that eye-burning white paper! We tried drawing manually with a ruler on our sketchbooks, but that was too much work. Then we ended up here." "You get the idea: we are sitting on a mountain of storyboard notebooks right now, just like a grumpy dragon sitting on a hill of gold," he adds. "Unlike that dragon, though, we are keen to share." Tadaa books are based in Australia, so if American or European readers want to buy a Storyboard Notebook from its site, it's going to cost a bit extra in shipping. But with 63 storyboard templates waiting to be filled across 32 pages (the most common picture-book page count), all printed on high quality 100 gsm ivory paper, this book is sure to be worth a few extra pennies.